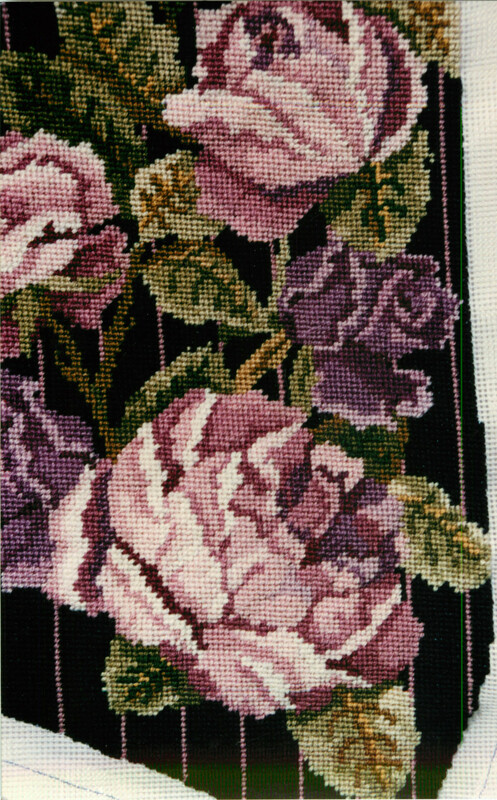 The gallery of needlepointed items designed by Diane Schultz as individual commissions, some stitched by the client, others by Diane. 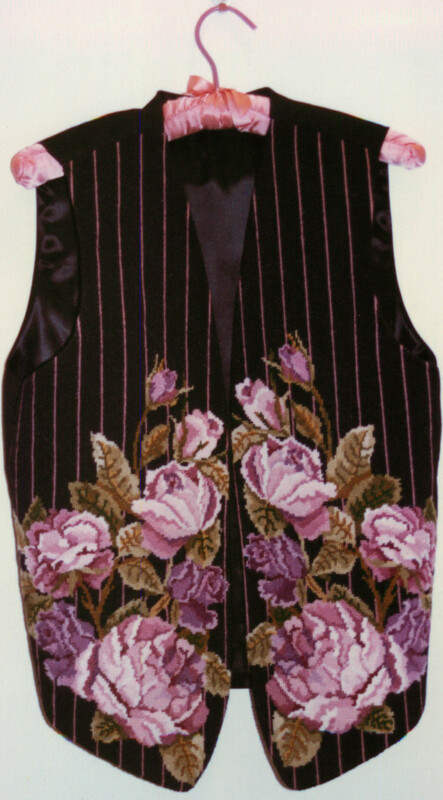 many showing use of decorative stitching. 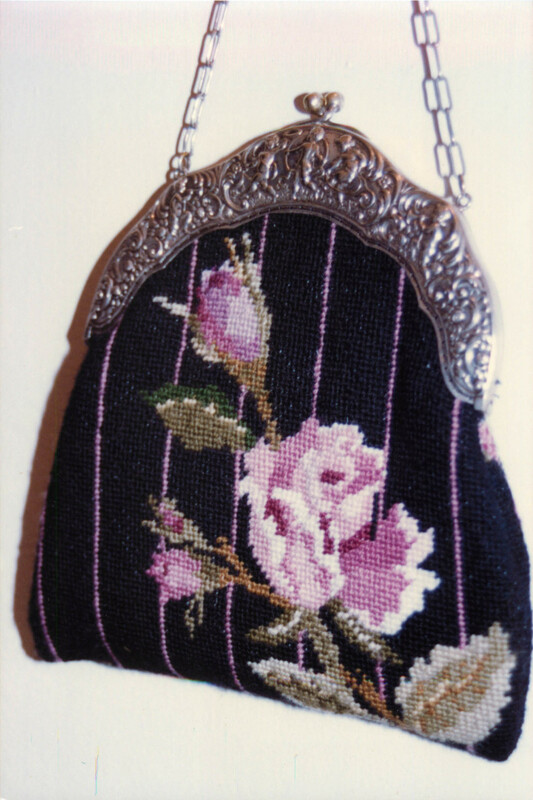 Here are some of the designs and stitching experiments Diane has carried out. Many are individual commissions, some stitched by Diane, other's as noted. Many of these examples appear in Wonderful Stitches. 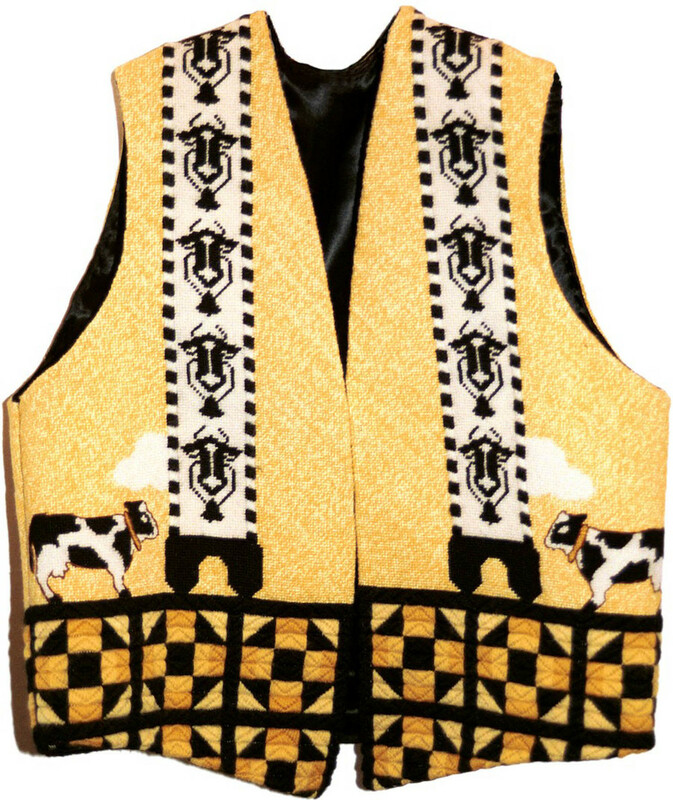 Front Panels of the needlepointed Cow Vest using pattern stitches and tent stitch combined. 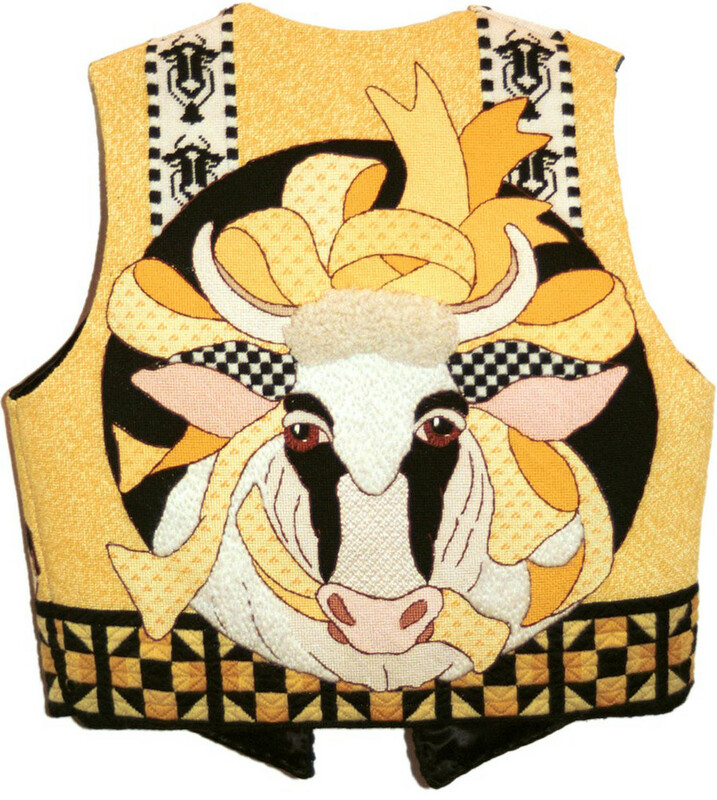 Back side of the needlepointed Cow Vest using pattern stitches and tent stitch combined. The needlepointed Pumpkin Vest uses decorative stitch in the large areas and tent stitch for the pumpkins. 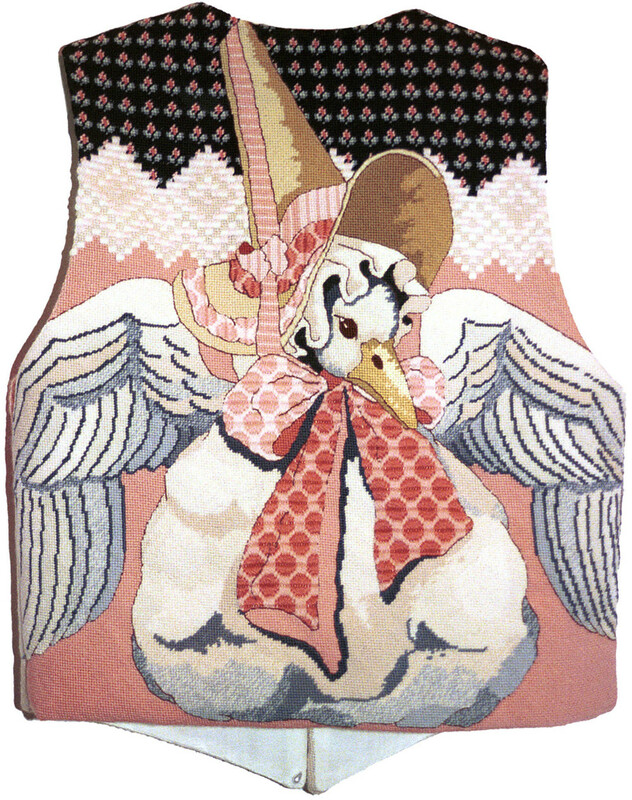 The back side of the needlepointed Pumpkin Vest repeats the themes of the front side, with the "Witches" cat prowling across. These needlepointed shoes complete the Pumpkin Vest theme. 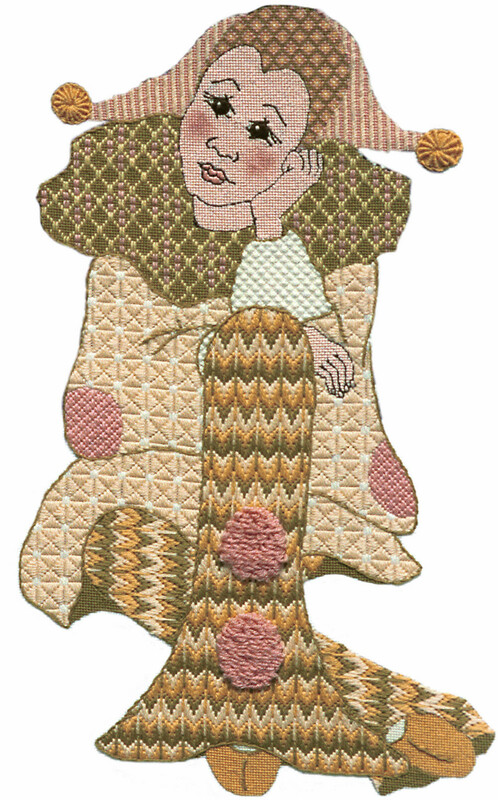 The stitches of the Quilt Sampler use those shown in the Wonderful Stitches book. After a few simple shading designs, I received a request for cabbage roses! With this piece, I relearned the value of highlight and shadow. These (vs. the midtones) define the shape. I gave up designing backs on vests after doing six vests. They are quite heavy, take a long time to stitch, and present some aggravating construction problems. RIght Side Detail Lower Left of Right Side Panel. My love of pattern shows up again in the simple pinstriped background: subtle, but it lends interest to the design (as well as to the stitcher). I learned how hard it is to do the second side of the vest in reverse (mirror image), a problem not faced by those who stitched the design after me. This was my husband's, Roger's, experiment in writing a photo to chart program, then doing the stitching on 18 canvas. It became a UFO (unfinished Closet Object) when he discovered how hard 45 colors and 18 stitches were. 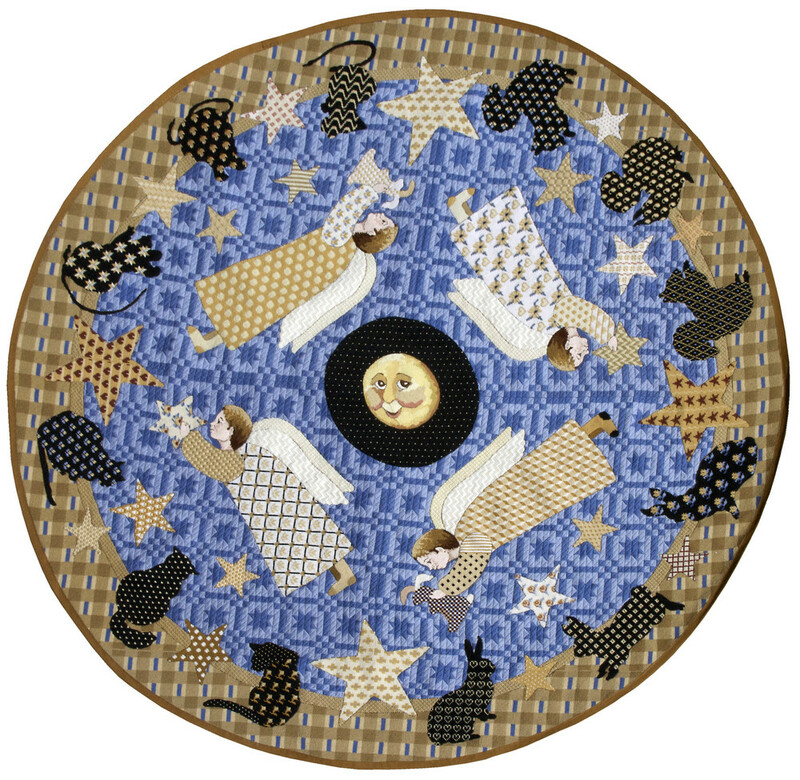 Many decorative stitches in this 5 ft diameter circular area rug. This was stitches as 7 separate parts pieced together. A vest designed for the owner of a children’s bookstore. The choice of polka dots, stripes, a tiny flower, the fancy edging and the color scheme all fit the childhood theme. A Christmas Lamb stands in front of a repeat of the Christmas Star block. 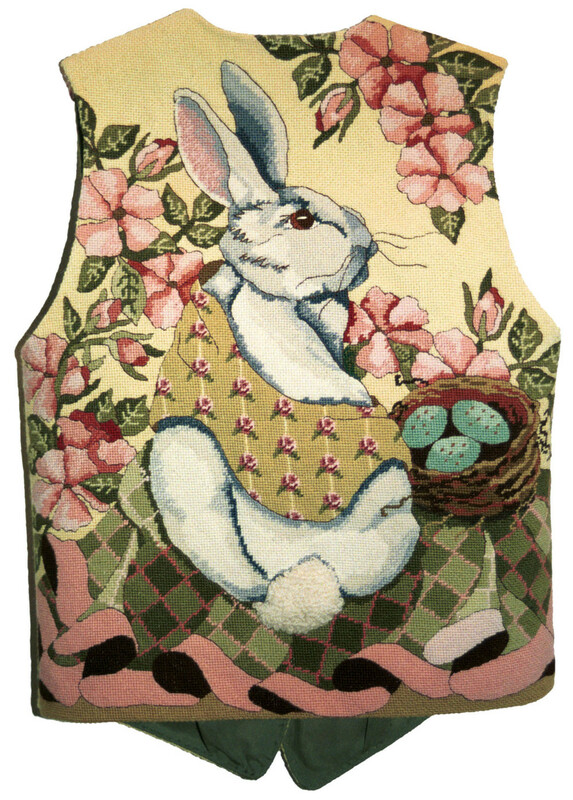 The rabbit uses a technique called tweeding, stitching with two different colors in your needle at one time. Detail from Diane's Harlequin Quilt Portrait. 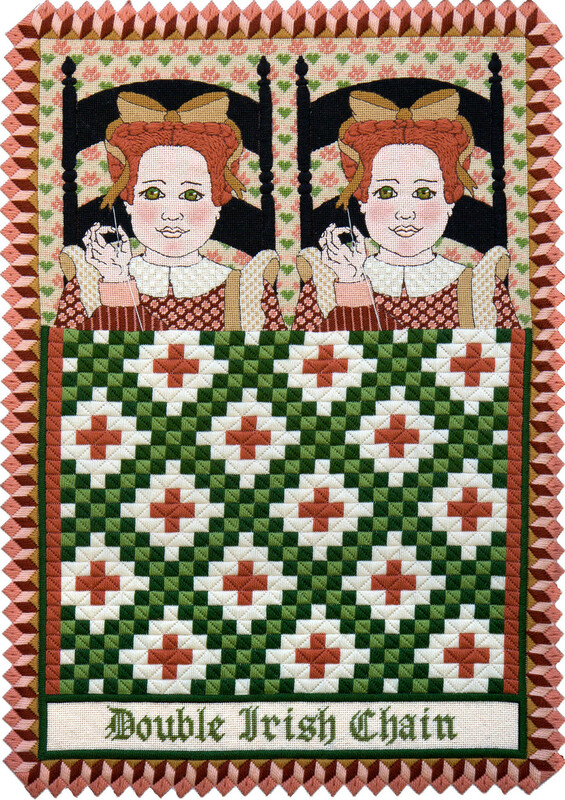 This needlepointed quilt portrait is one of a series Diane has constructed based on quilt block names. It measures 21" by 29", and is stitched on 12 count penelope.